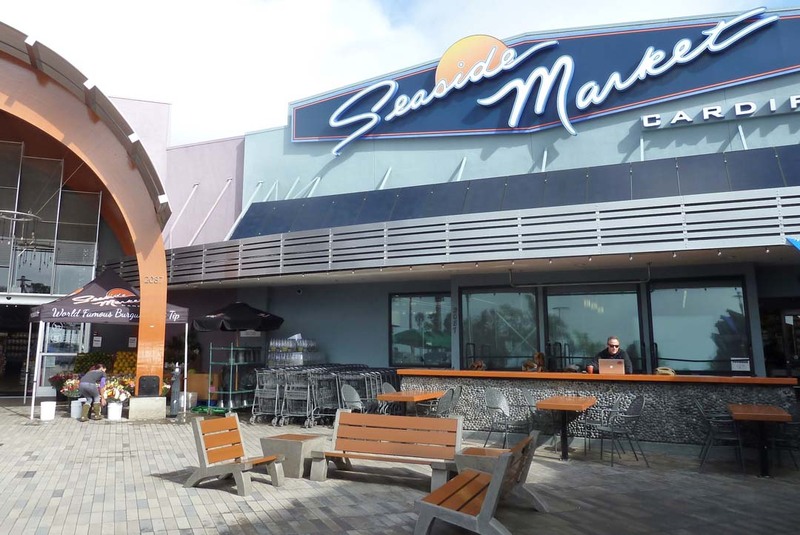 At first glance, the entrance to Seaside Market in Cardiff appears more a promenade of relaxed coastal beach colors and culture that have attracted the beach community for years. A large signature logo in inviting blues, a lively entrance in wood décor that links with similar looking patio and cafe seating and a multi–hued stone walkway leading to fruit and veggie stands, is as attractive, relaxing and comfortable a natural food market as you can discover. Once inside, Sinatra music, and a festival of eye-pleasing imagery of coastal beaches, fishing and surfing are presented in larger-than-life vivid photography. Another wall reveals a historic collection of surfboards and a four-panel super sized video board of special products and an outside weather station. Each department in Seaside Market is bustling, attractive and well-stocked with fresh food, health products and services, beverages, baked goods, floral and gift, meats, seafood, cuisine to go and a charcuterie of cheeses and cold cut meats. 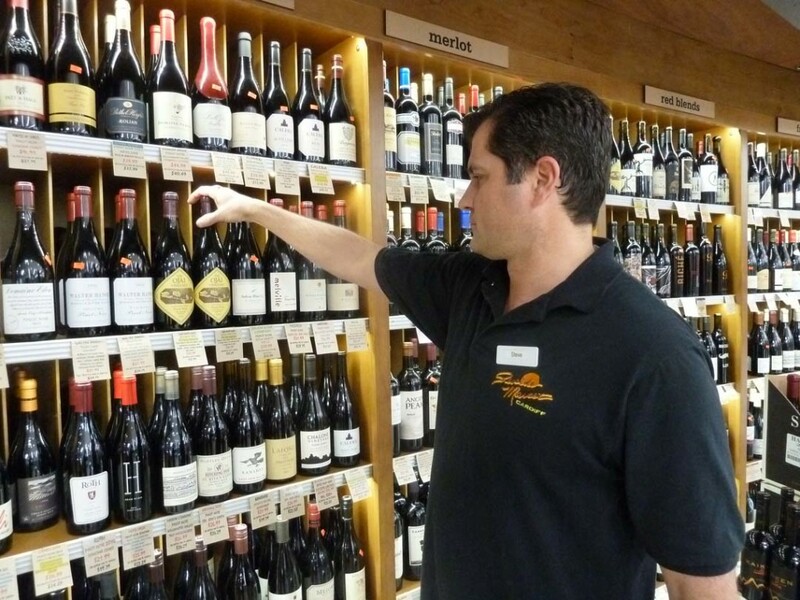 I was on assignment to meet the wine department buyer, Steve Ark, who is the architect of a vastly expanded wine department that has grown some 50 percent since the market improvement projects were put in place. The well-lit, soft circle department invites consumers to surround themselves with a world of choices, exciting to review familiar favorites as well as new discoveries. Ark has been involved with Seaside and its wine department for some 15 years and has seen it all. He has a self-assured confidence in all the names and wine countries chosen, and keeps up to date with wine trends. I asked him what was moving off the shelves these days. I noticed that the wines offered were in most price ranges and were stable, well marked and in easy to read categories. Seaside Market has a famous Burgundy Pepper Tri Tip, infused with a secret tumbling process that only Seaside presents. At $16.99 a pound, it quickly sells out daily. I put the question to Ark about pairing it with wine. “I would recommend a big red like a Zinfandel or a Syrah,” he offered. Moving closer to me and pointing to an Oregon Pinot Noir with a decidedly Burgundy flavor, his personal choice became evident. “But that’s the one I would have with it,” he said. Just above the wine department sits an upstairs mezzanine with a kitchen for food preparation. Wine tastings and full courses of wine and dinner events are in the planning stages. More than ever, Seaside Market will be more of a community gathering place of special of importance. Visit seasidemarket.com. Parc Bistro-Brasserie in the Bankers Hill District of San Diego presents a Keenan Wine Dinner with winemaker Michael Keenan Feb. 22 at 6 p.m. Call (619) 795-1501 for pricing and menu. Laird Family Estate of Napa Valley with owner/winemaker Rebecca Laird will direct a wine dinner at The Barrel Room in Rancho Bernardo, Feb. 22 from 6 to 9 p.m.; $80 provides five courses and seven tastings. Phone (858) 573-7512. Vittorio’s in Carmel Valley brings you a Trinchero Family Estate wine dinner, from Napa Valley, Feb. 23 at 6 p.m.; $54.95 per person. 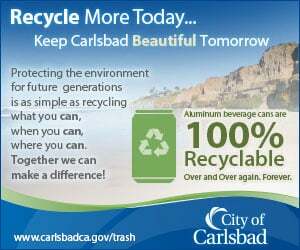 Make your reservation at (858) 538-5884. A Bene di Batasiolo Wine Dinner comes to Osteria Romantica in La Jolla Feb. 23 at 6:30 p.m. Main entrée will be braised beef with Polenta, paired with a Batasiolo Barbera. Cost is $45. RSVP at (858) 551-1122.